The level of pain felt will depend on the position of your tattoo, the amount of treatment required and your own pain threshold. Some clients would describe it as no more than uncomfortable, where others will describe it as an elastic band being flicked against the skin. The truth is that you will only know how painful you find it until you try it! We can offer advice on pain relief, which will be given during your assessment. As the Nd YAG Q-Switched Laser comes into contact with the tattoo, the laser light is absorbed by the tattoo ink which then creates a photo acoustic shock wave that releases the heat from the tattoo and shatters it into minute particles. While this response shatters the particles this is known as a photo mechanical effect. When the particles are shattered they are then able to be carried away by the macrophages and leave the body through the lymphatic system. This then leaves the body through the kidneys and into the urine. Although there is a risk of scarring with any laser, in most cases, scarring is not a significant risk for tattoo removal with the Nd YAG Laser. Tattoo removal has become associated with scarring because the older generation of Lasers used for tattoo removal were highly aggressive and carried a very high risk of scarring. 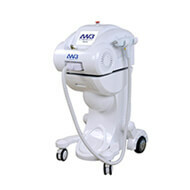 The Nd YAG Laser does not heat the surrounding skin significantly and the risk of scarring is much reduced. To reduce the risk, we also carry out an extensive medical evaluation to identify high-risk clients. What skin types can we treat for Laser Tattoo Removal? We can treat all skin types with the AW3 Flash Ink Nd YAG Q-switch technology. If you are in good health (no serious health concerns) and do not have hypo/hyper-pigmentation, tanned skin or Keloid scarring in your family or personal history. How long does the Laser Tattoo Removal treatment take? This depends on the size of the tattoo; a small tattoo might take 5 minutes, whereas a large, or multiple tattoos could take up to an hour or more of treatment. The consultation will provide this information. What colour tattoos can we remove with Laser Tattoo Removal? In principle, the Laser can remove all kind of tattoos. Since all tattoos are not the same in terms of colour, depth & their chemical composition, some may respond differently. Black, Red, Dark Orange & Dark Blue tattoos will typically respond better to treatment with Laser. However, Brown, Purple, Green, Light Orange, Neon & Light Blue colours are harder to remove and can require more sessions.